'I wouldn't have wasted his time with it,' he told Congress. 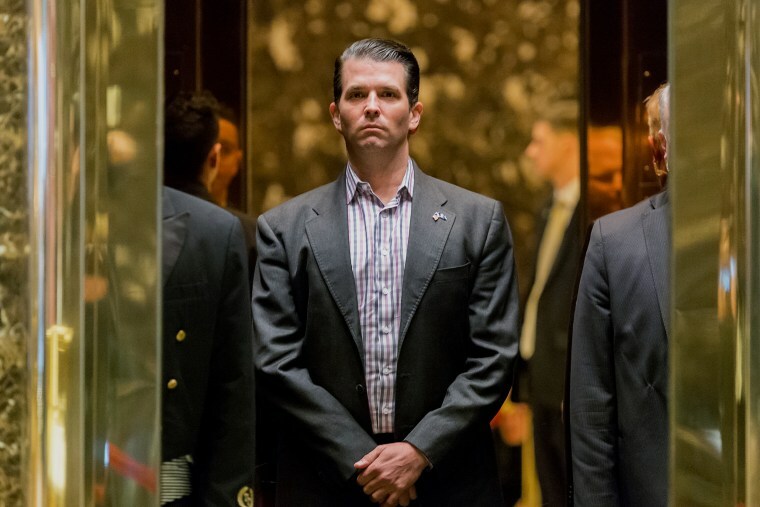 "Obviously he's aware of it now because he's read it, it's been in the papers, but that's the extent of my knowledge of his knowledge of it," the president's son told the Senate Judiciary Committee during closed-door testimony in September. "I wouldn't have wasted his time with it," he said, explaining that he took the meeting because he was told a Russian lawyer had dirt on Hillary Clinton that never materialized. He was asked whether he "or anyone else" had encouraged Russians to hack Clinton's emails — which his father had done in July 2016, generating headlines. Trump Jr. said he himself had not. "I don't remember if anyone else did," the president's son said. He also said his father has never expressed to him any frustration with the ongoing investigation into Russian meddling in the 2016 election. He was grilled about a phone call he made to a blocked number during the planning stages of the Trump Tower meeting, but said he didn't remember who he spoke with. Asked whether his father used a blocked number, Trump Jr. said, "I don't know." The gathering was brokered and attended by Rob Goldstone, a colorful music promoter who represented Russian pop star Emin Agalarov, the son of oligarch Aras Agalarov, who asked him to set it up on Veselnitskaya's behalf. Also in attendance were President Trump's son-in-law and adviser, Jared Kushner; former campaign chair Paul Manafort, now under indictment; Rinat Akhmetshin, a former Soviet counterintelligence officer working as a lobbyist in Washington; Anatoli Samochornov, an interpreter; and Ike Kaveladze, an executive at the Agalarovs' real estate company. "It's a really potentially serious situation — so you and your father should be aware," Goldstone added in the email. They are concerned because it links Don Jr. to officials from Russia — which he has always denied meeting. "In the call at the end, [I said] that I believed it was a bad idea and that we shouldn't do it," Goldstone said. "He said, 'It doesn't matter. You just need to get the meeting.' And then I said, 'I think this is a really bad idea,' " Goldstone added. In 2017, Trump Jr. tweeted out an email he'd sent to Goldstone prior to the Trump Tower meeting in which he responded to the possibility of getting Clinton dirt with, "If it's what you say I love it." Goldstone told the committee that the president's son-in-law, Kushner, also seemed annoyed that Veselnitskaya's spiel didn't contain an obvious "smoking gun." "After a few minutes of this labored presentation, Jared Kushner, who is sitting next to me, appeared somewhat agitated by this and said, 'I really have no idea what you're talking about. Could you please focus a bit more and maybe just start again?'" Goldstone said. Kaveladze, the Agalarovs' U.S.-based associate, testified that they asked him to arrange a date for Veselnitskaya to see the "Trump people," with Goldstone once again acting as the go-between. The promoter fretted that Veselnitskaya wanted to give the same exact presentation but passed on the request to Trump's team. It never happened. The first try occurred when Trump went to Russia for the Miss Universe pageant in 2013. Then, in 2015, Trump was invited to the elder Agalarov's 60th birthday party in Moscow. Trump employee Rhona Graff responded to Goldstone that she doubted the candidate could make it, to which Goldstone responded that Trump might "welcome a meeting with President Putin, which Emin would set up." The committee previously released testimony from Veselnitskaya, who has also given extensive interviews to NBC News, and from Glenn Simpson, the founder of research firm Fusion GPS, who worked with Veselnitskaya on Magnitsky act matters and who also commissioned the infamous dossier that detailed Trump's alleged Russian links.